I get a lot of enquiries from people who want a binocular ideal for long range viewing (often from those lucky enough to be living near the coast, who want to look out at sea), but who also want to be able to use them in the evening and then again at night for astronomy. To accommodate these needs you of course need a higher than normal magnification, but also much larger lenses that can capture more light in order to get a good quality as well as bright image, which is even more critical at night. As this type of observation is mostly based from a fixed point, transportability and ease of carrying are not the biggest concerns, which is a good thing because as you increase the size of the main objective lenses, the overall size and weight of the instrument obviously also increases. Whilst Celestron are best known for their telescopes, they also produce a number of standard daytime and astronomy binoculars. 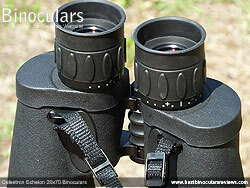 Their very popular SkyMaster series is aimed at the more budget conscious user (for example see my review of the Celestron SkyMaster 25x70 Binoculars), whilst the Echelon series that are put together by hand in the USA using high end Japanese optics is focused more on quality: material quality, build quality and the image quality. Apart from the typically elongated barrels found on most on high powered binoculars, the overall shape is essentially the same as that of most porro prism bins with the eyecups being closer together than the objectives. Whilst this traditional body shape is necessary due to the design of the roof prisms and the way the light passes through them, it also happens to make for a fantastic ergonomic shape that feels very natural as well as comfy and secure to hold in your hands. 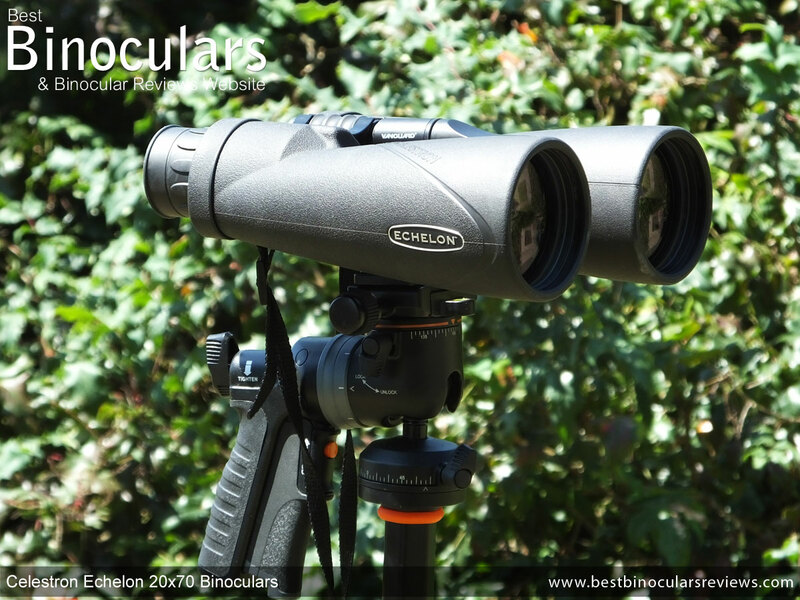 A slight difference to the norm is that rather than having a single wide central hinge, these Celestron Echelon binoculars have two thin arches that span the gap between the barrels, which I guess helps a little in reducing weight and because they are metal and not plastic like some I have seen, there is no compromise on strength. Covering almost all of the exterior (apart from the hinges) is a rubber casing that is designed to help protect the optics as well as increase grip levels. This rubber "jacket" on these is really nice and thick and so it unquestionably offers more impact protection than on most bins that I have used. On the underside of the body, Celestron, like many other brands have added a couple of smoothed depressions that are positioned so that with your thumbs in them, you are not only holding the bin in the right spot, but also in the right way that really helps you to quickly find a good balance. On the 20x70 Echelon, these work really well and I found that using them, I did indeed have a nicely balanced instrument, making it much easier to keep them steady and use for longer periods without tiring. The large 70mm objective lenses are located about 14mm in from the end of each barrel. This is quite a bit deeper in comparison to most standard sized bins, which is great as the body overhang shelters the glass from dust, rain and can also help reduce or stop sun-flairing from occurring in certain situations depending on the strength and direction of the light. Unlike the cheaper Skymaster's where Celestron do not specify the main housing material, but which I presume to be polycarbonate, they proudly advertise that this 20x70 Celestron Echelon and indeed all the others in the series are made from aluminum. Whilst this material may not be as cheap or as lightweight as the polycarbonate ones, it is definitely stronger and most certainly contributes to the reassuringly solid and by and large feel of a quality instrument. 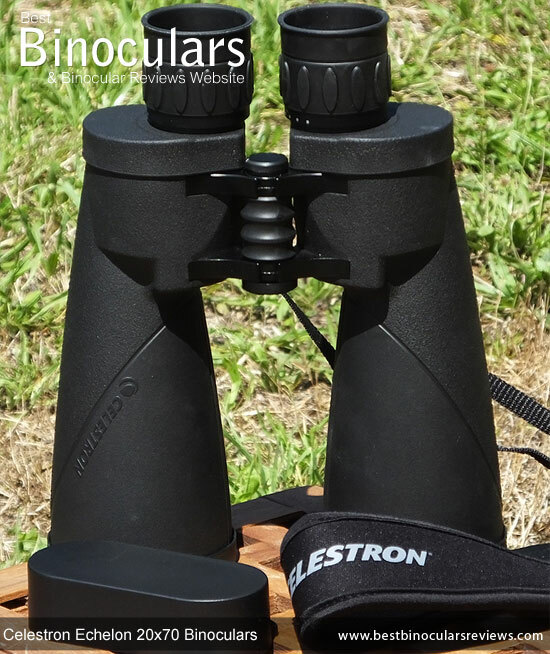 Another quite important difference between these high end Celestron Echelon binoculars and the entry level Skymaster's is that the body on these has been fully sealed and they are described as being waterproof, whilst the Skymaster's are not. What is more, they have also been nitrogen-purged. This means that all the internal air has been extracted and replaced with nitrogen gas which seals the internal optics from fogging. Even if you never take them outside, having a sealed and fogproof binocular is important. Firstly it is another indication of a bins class and secondly, remember that as well as liquid and moisture, it will prevent dust and other tiny particles from being able to get inside and potentially spoil the optics and your view. 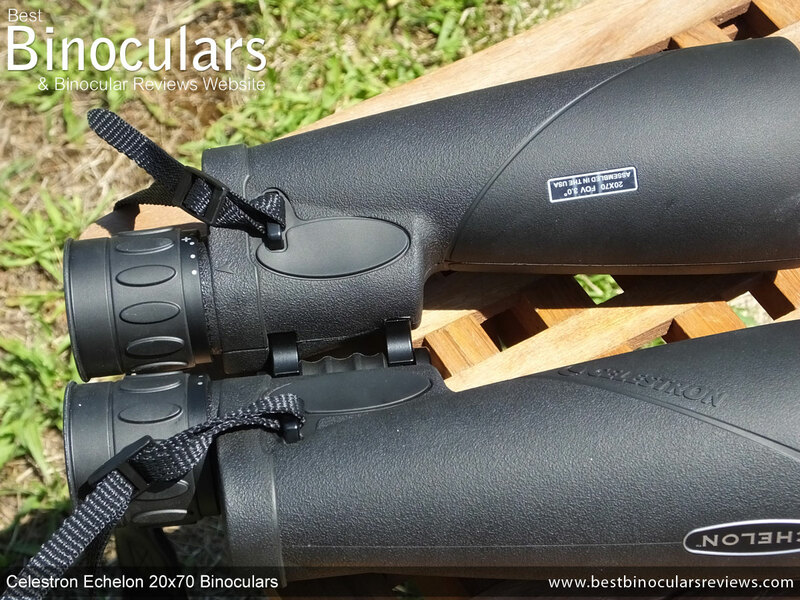 Whilst I have already mentioned how well balanced the Celestron 20x70 Echelon binocular is and even with the high power and the fact that it is fairly heavy, it is still possible to use it very effectively with only your hands. However in some situations (like viewing up into the sky) or if you need to look through them for longer periods or if it is imperative that you have a very still image, you are going to want to attach this binocular to a tripod. Celestron have made this very simple to do: By unwinding the dust cap located on the front face of the hinge, it reveals a standard sized thread, to which you can then screw in a binocular tripod adapter. This adapter can then easily be fixed directly to your tripod, or to your tripod head depending on your equipment. As you can see from the photographs, my preferred setup is to use what is known as a pistol grip tripod head that makes it far easier and faster to aim the bins as it works much more intuitively than a pan handle or standard ball and grip tripod head. I am currently using a Vanguard Pistol Grip Ball Head, which I really like but other photographic brands like Manfroto also make them if you are interested. Somewhat surprisingly and unlike the Skymaster that I reviewed, these Celestron Echelon's do not come with a tripod adapter included, however this is only a slight inconvenience as they are inexpensive and easy to get on the web. This also means that you do not have to opt for a Celestron branded adapter. I have used a Celestron adapter in the past that came with the SkyMaster, which was ok, but because it plastic, it did have a tendency to twist a little under the increased weight of a giant binocular. So for the best results I highly recommend that you ensure that you get yourself a good quality metal tripod adapter, see my section on binocular tripod adapters here for more info. 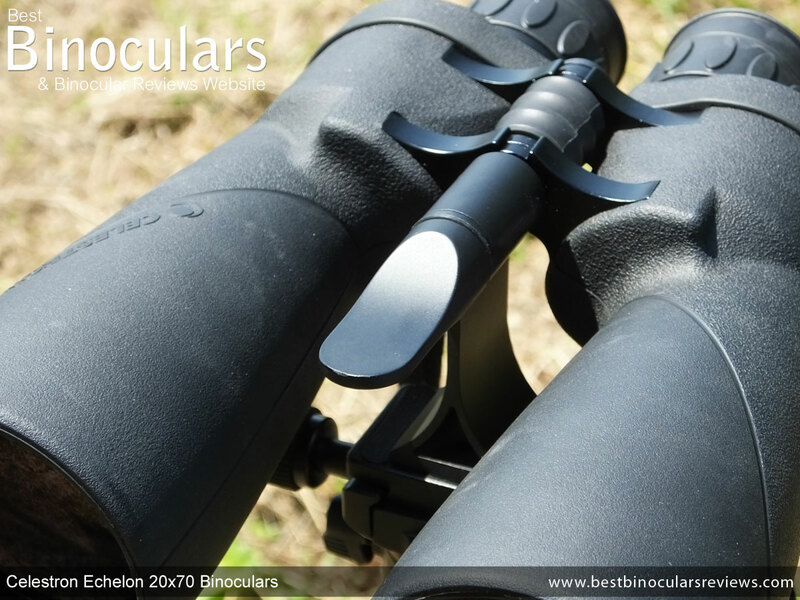 All Echelon series bins, including this model use a individual focus system which essentially means that you need to focus each eyepiece individually by setting the diopter, which simply means turning the eyepiece. 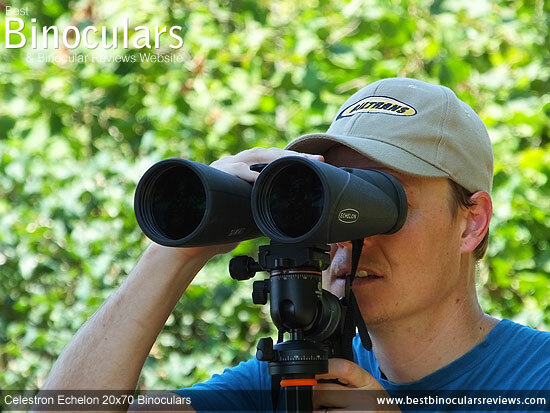 Because you have to adjust each eyepiece separately, it does take a little longer to focus on closer objects than most "normal" binoculars that only require you to turn a single often centrally located focus wheel that adjusts the focus on both eyepieces simultaneously. However remember that these Celestron binoculars are designed for long range observation and so for the most part, your focus will be set at infinity which means that you can use them instantly without having to make any further adjustments. The only time you will have to alter this is if you wish to look at nearer objects or if you were to share the with someone who perhaps has a different vision requirements to your own. In some ways these are quite similar to fixed focus binoculars and they have a long depth of view, but they are actually more flexible than these as you also the added flexibility of being able to adjust the focus more accurately onto objects that are a closer ranges. The eyepieces on this Celestron binocular feel really strong and whilst it is quite difficult to tell, it looks to me that the eyepiece housing is made from metal. This is excellent as this is the most common part of a bin that gets damaged or broken, yet to save costs many out there are made from plastic. There is a thick rubber coated track on top of the housing, which has a number raised oblong oval shapes on it that help with grip for when you are adjusting the focus. Celestron have also included a printed scale on each eyepiece that you can use to make setting up the focus at different settings a little quicker. It takes just under 1 full rotation (360°) of the eyepiece to take the focus from infinity to it's minimum close focus of 328.1 ft. /100m. The turning mechanism for each eyepiece on my test pair was nice and smooth, but with some resistance that eliminates any unintentional turning. What is more, there was absolutely no free play or movement in either eyepiece which was great and shows just how well they are made. 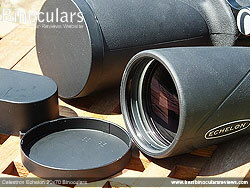 The Celestron Echelon comes with rubber Roll-Up/Down eyecups. They are very large and have a 50mm diameter and because the rubber is quite soft, make for comfortable viewing. The Celestron Echelon 20x70 comes with an eye-relief of 19.5mm which is very long and thus they should accommodate most peoples needs. If you wear glasses, you can just roll down the cup and keeping your glasses on, position your eyes the correct distance behind the ocular lens to get a full uninterrupted view. The distance between the pupils or the interpupillary distance (IPD) varies from person to person and so to cater for this and thus ensuring that you see a single clear image when you look through the eyepieces, you can adjust the binocular by opening and closing the hinges until the ocular lenses match the space between your eyes. This Celestron 20x70 binocular can be adjusted to a maximum IPD distance of 7.2cm, and a minimum of 5.8cm. This is a good range and means that they should cater for most peoples needs. 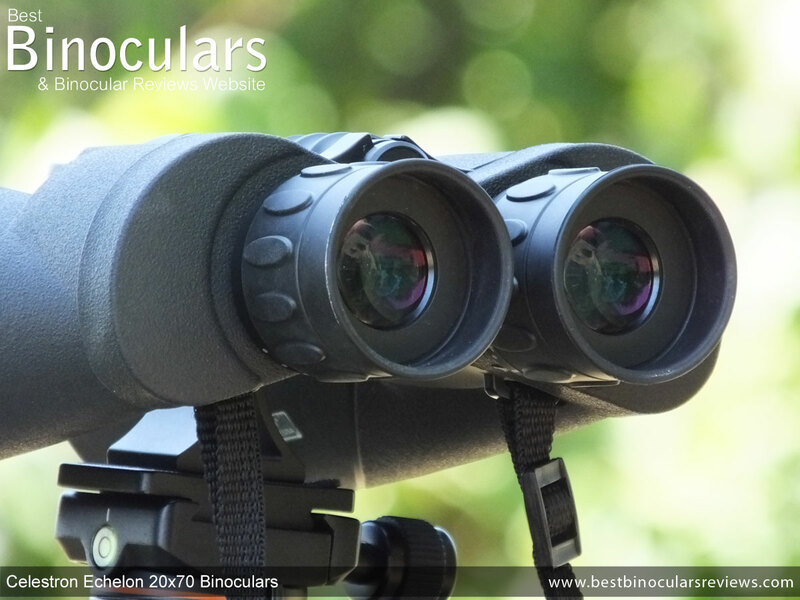 High powered binoculars designed to excel in poor light or be used at night for Astronomy will always be larger than standard full size binoculars because they need much larger lenses to compensate for the high power and collect as much light as possible. 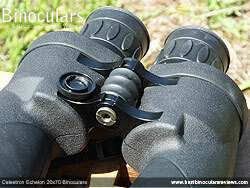 Any binocular like these with objectives larger than 60mm is usually referred to as a "Giant Binocular". The official length of the 20x70 Echelon is 25.8cm (10.15in), which I measured and is correct (without the lens covers on, the eyecups out and the ocular lenses fully twisted in). The published width is 22.2cm (8.74in), this is with the hinge fully open (IPD set to max), this width can reduce to 20cm when you close the hinges (IPD set to minimum). Likewise the height is 8.4cm (3.31in) with the hinge closed, this reduces slightly to just over 8cm when you open them. At 1650g / 59oz, they are as you can see from the table above a little more than double the weight of most standard sized bins. However they compare well to other giant binoculars and whilst they are heavier than the SkyMaster, remember that these have higher spec features like a full aluminium body, rather than a polycarbonate one that many cheaper bins will use. 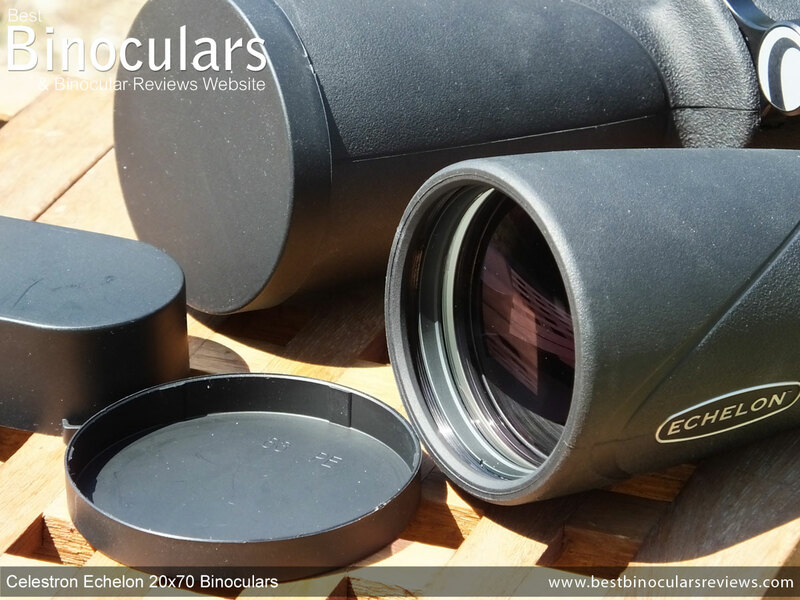 The ocular lenses are 25mm in diameter on these Celestron Echelon 20x70 binoculars which is pretty larger and as you may expect somewhat larger than those found on most standard sized bins in my experience. The larger surface area of the lenses means they have the ability to capture more of the available light, but as you increase the magnification, the amount of light that gets through to your eyes decreases. So for example, all 20x70 binoculars like these produce a shaft of light that is 3.5mm wide (70 ÷ 20 = 3.5) - this shaft of light that exits the ocular lens in known as the exit-pupil. A large exit pupil makes it easier for you to line up your eyes with the light and thus see the full image, but depending on conditions and your own eyes, makes a big difference on how bright an image you see. When your size of your pupils are the same size or smaller than the exit pupil (In good light conditions), it is not a limiting factor. However when it gets darker and your pupils dilate, bins with smaller exit pupils will seem less bright than equal quality ones with larger shafts of light exiting them. Thus if we go back to the formula and apply it to the Celestron SkyMaster 25x70 that has the same size lenses, but a higher power, we can assume that whilst you may get a little improvement on image detail, it's 2.8mm exit pupil (70 ÷ 25 = 2.8) will translate to it looking less bright at night and in poor light than these Echelon's. This is especially true because the quality of the optics and their coatings are sure to be of a lesser quality on the cheaper SkyMaster's which also plays a major role in brightness and quality of view. 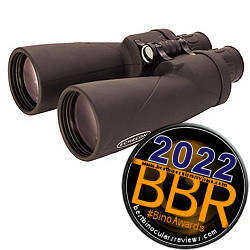 If you wanted a higher power than the 20x offered on these, but still similar low light capabilities, you could opt for a bin like the Zhumell Tachyon 25x100 or the Celestron SkyMaster 25x100 that produce 4mm exit pupils (100 ÷ 25 = 4). The trade off to this is of course a much bigger and heavier instrument that will most certainly require you to use a tripod most of the time. Their iconic shape, with the ocular lenses closer together than their objectives, means that you can almost instantly tell that these Celestron Echelon binoculars have porro prisms inside of them. Because of their shape and they way that the light enters and exits these prisms, it usually means that they make for a less compact bin than those that use a roof prism where the light exits the prism in the sane line as it entered it. However apart from this, the porro prism does have a number of advantages. The first is that because the objectives are placed further apart, you get more of a stereo effect with a better perspective and sense of depth. The light that exits these prisms is also not moved out of phase as is the case with roof prisms and thus do not require specialized and rather expensive phase correction coatings to produce the same quality of image. Also all the glass surfaces that the light bounces off within the porro prism reflect 100% of the light that hits them. This is also not the case with a roof prism and they once again require expensive highly reflective coatings to achieve the same transmission levels. 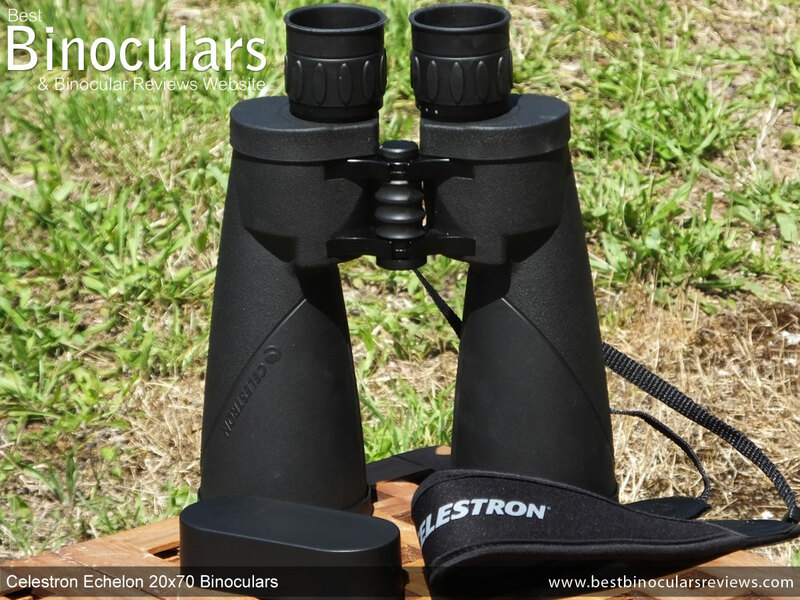 Celestron also highlight that the prisms are made from BaK-4 glass that in most cases is considered to be as good as it gets on a binocular. These special coatings are added to the glass surfaces to increase transmittance levels, for a brighter image, but also improve the view by eliminating unwanted reflections that can cause undesired results. 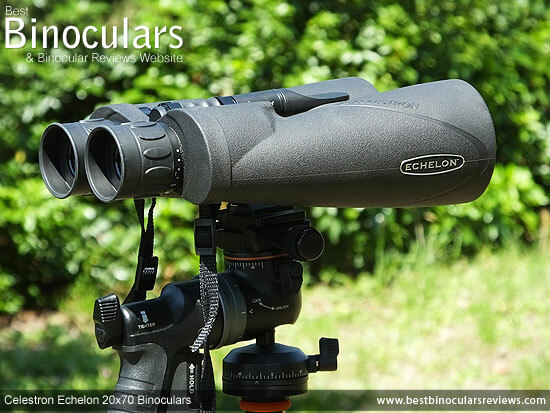 One of the big improvements between this Echelon and the SkyMaster is the fact that these have Fully Multi-Coated optics, whilst the Sky Master's are only Multi-Coated. The difference is that the Multi-Coated SkyMaster will have anti-reflection coatings added to only some of the glass surfaces, whilst these Fully Multi-Coated Echelon's will have these coatings applied to every single glass surface throughout the optical system. On top of this, not all anti-reflection coatings are made equal. Celestron highlight that they use their "proprietary XLT coating" on these for "maximum light transmission". Now I cannot comment as to Whether or not his is better or worse than another manufactures coatings, but we can assume that it is better than the coatings used on their cheaper ranges like the SkyMaster's which use their standard and not the "special" XLT coating. 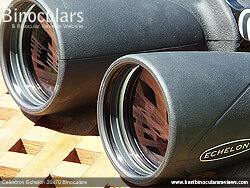 The obvious advantage of a high magnification is that you get a more detailed view. On the flip side, you usually also get a far narrower width or field of view. 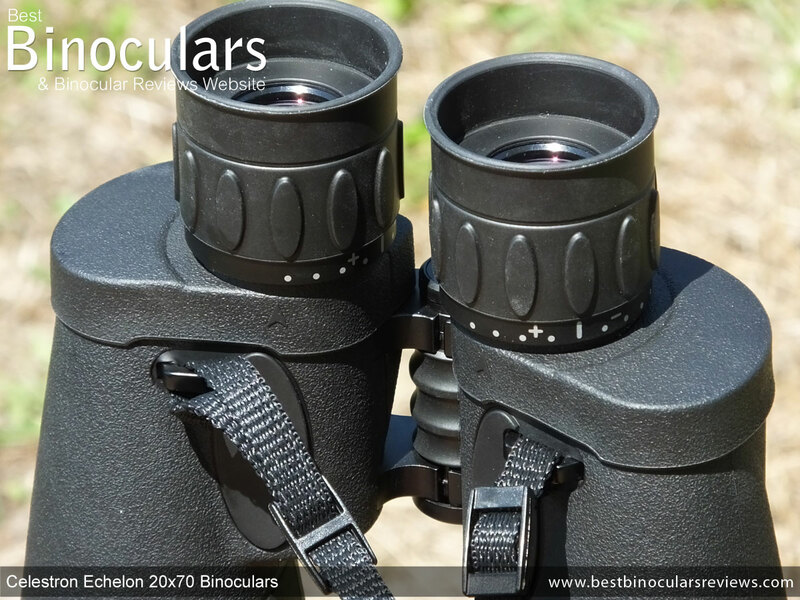 These Celestron 20x70 Echelon binoculars have an angle of view that is advertised as being 3°, or to put it another way, the view you see is 52m wide at a distance of 1,000 meters away (157ft at 1,000 yards). So as you would expect this is far narrower than a more standard 8x or 10x bin, that can have a FOV more than double than these, but compared to other high powered bins, they compare rather favourably and far better than the 25x70 SkyMaster's Also worth noting is that the FOV on these will be much wider than that on almost all home telescopes, which is why astronomy binoculars like these are ideal for scanning the sky before using your telescope to get closer to what it is that you want to see. Higher magnification bins tend to have a more distant minimum close focus than lower powered instrument. Add to this the individual or fixed focus mechanism that requires them to have a really long depth of view and it is no wonder that they have a very far near focus of 328ft. As they are designed for long distance observation this should never really be a problem, but may be something to keep in mind for some. At 19.5mm, I would describe theses as having a really long eye-relief, making them an ideal choice should you wear glasses whilst using your binoculars. To try and get a consistent opinion, I like to compare the view I see through the binocular under review with that of a similar benchmark binocular of mine. I have a number of these in most standard configurations, unfortunately as of yet, I do not have a giant benchmark binocular. Keeping in mind that my 10x42 benchmark has an exit pupil of 4.2mm (42 ÷ 10) and these have a 3.5mm (70 ÷ 20) exit pupil, it is not surprising that even though it was quite difficult to tell because of the large magnification difference, I did think that my benchmarks were brighter in low light, but the difference was not huge and you do of course get a much more detailed image with these Echelon's. This tends to let me conclude that for a high powered bin like these, these are pretty good low light performers. Sure a super giant 20x100, would be even better, but you just try and hand hold one of those! In good light they looked to be about equal, which once again, because my pupils were probably smaller than both the exit pupils, is not surprising. Not much to report here, other than to say that the colors look nice and natural and free of any artificial tinting that I sometimes witness, especially on cheaper optics. Likewise, I thought that the contrast between light and dark was good, which really helps to give a nice feeling of depth, which a further distances is quite important. On some bins you get a large region around the edges of the view that is a little fuzzy. This amount of softening varies, with the best ones having almost none at all. I would say that whilst these are not the best I have ever seen, they sit near the top and the amount of softening that you can see is really not important and honestly only really noticeable if you are actually looking for it. 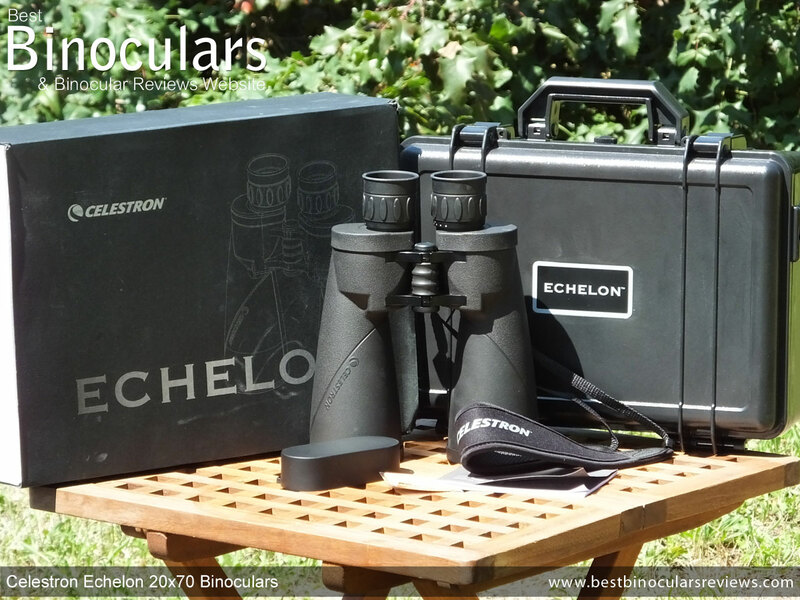 Because these Celestron Echelon Binoculars have such a long minimum focusing distance, it was a little more tricky than usual to look out for signs of color fringing around the edges of objects. I think in extreme cases where you have very highly contrasting objects in front of each other there is some fringing, but like the softening, the amount is really negligible and nothing to be worried about. These long range/astronomy binoculars are quite a bit bigger an heavier than your average general use or birding binocular and so having a case that is designed to be carried out in the field is actually not really needed. So it is fantastic to see that Celestron have included a very high quality hard case that offers the best protection possible for your optics. 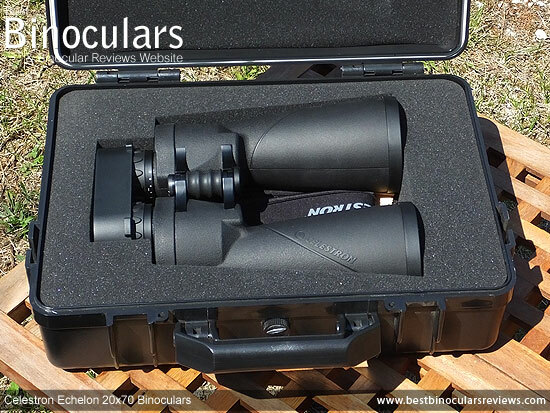 The the foam inner is cut-out to fit the binoculars perfectly and once closed and sealed the case is also waterproof as it has a rubber O-ring around the lid, so not only are they protected from fairly large impacts, but also from dust and moisture as well. On the exterior and under the carry handle is a cap that you can twist top open and thus equalize the internal pressure when transporting the binocular between places that have different altitudes. The foam padding is 6mm thick and 55mm wide at the point that goes around your neck. This combined the fact that is is slightly curved to fit better around your neck and shoulders means that it is nice and comfortable to carry these comparatively heavy optics. The strap fixes to the instrument in the standard way on the sides using a slider that you thread the strap through and then back on itself. The soft plastic objective lens covers fit nicely over the ends of the 70mm barrels without being too loose or tight. They are pretty simple and don't have a loop or another way of keeping them attached to the binocular when not in use which is a little bit of a shame as after a time it does become somewhat painful having to find and replace them after every use. So what often happens is people eventually leave them off, which in turn means dust gathers on your lenses, which means more frequent cleaning is necessary and the potential to damage the lenses or coatings. Like the objective lens covers, the eyepiece cover is very simple. Indeed it is not much more than an oval shaped piece of soft plastic that fits over the eyepieces. However the fit is good and it does come with a couple of loop holes that you can thread the neck strap through to keep it handy should you wish. Celestron also include a cleaning cloth, that is fine for emergency use out in the field of for cleaning the body with. But for regular and proper care of your lenses I highly recommend that you invest in a specialist optical cleaning kit. The included instruction booklet is generic for the Echelon range and includes some brief information on the most important aspects of the bin like setting the focus and diopter, care and storage as well as cleaning in English, French, Spanish, German, and Italian. Also included are details of the lifetime warranty and what you need to do should they need any servicing or repairs. Strong Points: The Celestron Echelon 20x70 binocular looks like it is, feels like it is and indeed is a high quality optical instrument made to very high standards using high quality components. 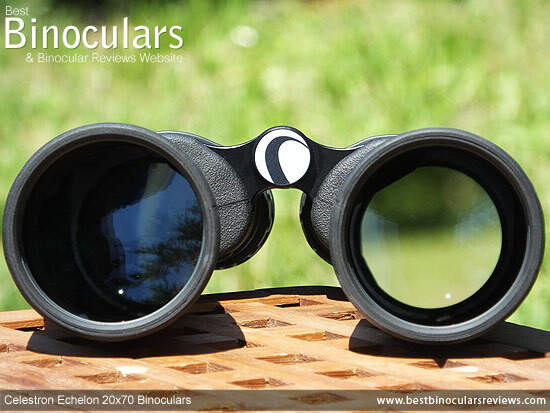 The aluminium body feels really solid and well made and unlike quite a few other giant binoculars, these are fully water and fogproof, which not only protects them, but is also another indication of their build quality. The large 70mm objectives have the potential to capture plenty of light, which is complimented with the use of really high specification glass and coatings that results in a great quality image and excellent long distance, low light performance. The eye-relief is really long, which for those who wear glasses whilst using bins is really important and their field of view is pretty good and up there with other 20x binoculars. The addition of the solid, waterproof carry case is also as good as it gets. Weak points? Whilst the neck strap and especially the hard carry case are excellent, I cannot say the same for the lens covers which have to be said are very basic. These may only be small accessories, but they play an important part in protecting your investment and whilst the ones that are included do work well enough, it would have just been nicer to have had some that matched the quality of the rest of the binocular. Whilst the individual focus system is perfect for most cases where you have the focus set to infinity for long distance viewing, I did find at times that I also wanted to get a better look at say a bird at the end of my garden. Here having to adjust each eyepiece is a little slow and so even though they are not really designed for nearer distances, I personally would have preferred a single central focusing wheel. This focusing mechanism also means that their minimum close focus distance is not close at all. Granted they are simply not designed for viewing nearby objects, but it does fall short of most of the competition and makes them a little less versatile than some. These really are a great pair of long distance and astronomy binoculars. The higher price may put off many casual observers or those newer to the hobby but for those who are more serious and/or are looking for a great quality view then these really are hard to beat and a big improvement on their SkyMaster Series in my experience. 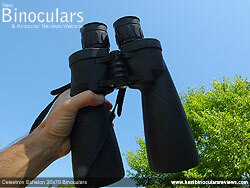 Ideal For: Whilst these are obviously quite a bit bigger and heavier than your average birding binocular it is still quite possible to hand hold them and use them in some situations, even with the massive 20x magnification. Thus with or without a tripod, I can see them being very useful for a wide selection of long range terrestrial uses and of course as a great set of astronomy binoculars. This will include those interested in plane spotting especially at higher altitudes where the high magnification is of course vital, but the reduced field of view is not as important as you can more easily follow the plane whilst holding them rather than them being mounted on a tripod. They will also make ideal bins for anyone who wants to scan distant terrain in search for something like wildlife for example and so in some cases could be very useful to hunters, if transporting them in the field is not such a big issue. But where I really see them being ideal is for those who want them easy at hand or mounted on a tripod at a place where you have a great view of a distant hill or out to the ocean or lake and you like puffin, seal or whale watching or watching sailing or ships. I see a number of phony reviews out there, put together by people who most certainly have never even used the product under review and they do nothing more than elaborate on the manufacturers marketing hype. I would like to assure you that this Celestron Echelon binocular review was written by myself after fully researching, testing and comparing it over a long period of time. I think it is also important to stress that the opinions and the conclusions that I come to after testing are my own and are honest. If I like something I will say so and if I don't that will also be highlighted. The manufacturers know this when they send me their products to review and I am never in any way encouraged to act in any other way.